We want to discuss the problem of being "cast out of the synagogue" and assurance. The old word from the Whore of Rome is excommunication. Baptists speak of being "churched." This I find very peculiar, for to be churched should imply that I have somehow been blessed by the Church of Jesus Christ. To call excommunication "being churched" tells me there is some implicit jackboot nature to the process. There are biblical grounds for the leaders of the local church to send away a rebel against Christ, or a willful sinner. But, most "churching" today has to do with nothing else but the pastor feeling threatened and forcing the threat away from himself. 1. The man was healed and delivered by Jesus Christ, and he was content to receive the work of God in his life without consulting the religious leaders. Today, many preachers insist that to be delivered from sin and death a person needs to be at their altar. They refuse to accept anyone being born again alone with Jesus Christ. 2. The Pharisees were willing to receive the work of God if it was credited to Jehovah God without giving Jesus Christ the glory. The healed man did not comply with this, so they railed on him. Again, many preachers today are willing for even Jesus Christ to get the glory as long as some glory is shared with the preacher and his program. 3. The beggar, though undoubtedly not very articulate in matters of theology and high toned Talmudic debate, walked circles around these erudite religious leaders with his simplicity and sarcasm. You need to understand that the smartest whip in the Bible college or the local church, when he gets out of line with the person of Jesus Christ and the King James Bible, is your target. You may mock him and deride him, as God does in his heaven. There is NO reason to show mercy. They are about to thrash and "church" you anyway, so show them themselves for the fools they are. 5. You need to understand that the one who follows Jesus Christ in a simple literal way WILL get into trouble with pastors and church leaders. They are the ones who resist the simplicity of the Good Shepherd with his sheep. They give lip service to Jesus Christ, but they love to have the preeminent place-- they want you to first submit to them. Being "churched" or cast out is very intimidating. The devil will tempt you to believe you are wicked, and you will feel you need to come crawling back to the great leaders and beg for your place back. I strongly encourage you to walk on with Jesus Christ. 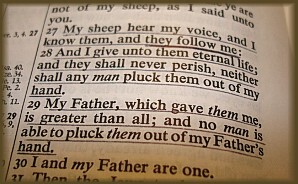 He has plenty of sheep with whom you will find fellowship. Do not run back to the hireling once you have escaped. Ask the Lord Jesus Christ to send someone to you whose heart burns for Jesus Christ and the Word of God. Don't look back-- the future is bright in your Good Shepherd.